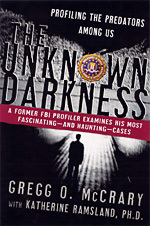 Mr. McCrary has co-authored the book “The Unknown Darkness: Profiling the Predators Among Us” with Katherine Ramsland, Ph.D. The work of Mr. McCrary—including some of the cases in the book—were featured in the hour-long season premier of “48-Hours Investigates” on CBS. The show aired on September 20, 2003. Be sure to include return postage. “In a book that combines engrossing writing with seasoned insight, McCrary, a 25-year veteran of the FBI and a former criminal profiler in the bureau’s renowned behavioral science unit, has teamed with Ramsland, a forensic psychologist and writer, to produce a detailed account of criminal investigative analysis. He describes 10 cases that provoked frenzied storms of media attention in their time including the FBI standoff with the David Koresh and the Branch Davidians, the murder of two Canadian teenagers by a husband and wife team, the hunt for an international serial killer and the infamous Sam Sheppard murder case which came to court for a third time nearly 50 years after it occurred.